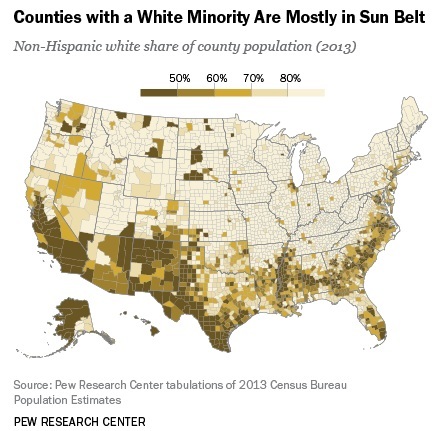 Among the 78 counties that between 2000 and 2013 went from majority white to places where whites are no longer more than half of the population, 14 were at least 60% white in 2000. Of these counties, those in Georgia stand out for having four of the five biggest percentage-point swings in their white-population share. For example, in Henry County (pop. 211,000 in 2013), 35 miles south of Atlanta, the population’s white share fell from 80.1% in 2000 to 49.8% in 2013. In Gwinnett County (pop. 859,000 in 2013), also near Atlanta, the population dropped from 67.0% white to 41.6% over the same time period. This trend stems from a flat or declining number of whites in each of these four Georgia counties (Douglas and Rockdale are the other two), combined with a large and growing black population and a smaller Hispanic population that is also increasing in number. (In recent years, many blacks have moved to the Atlanta area from Northern states as part of a return migration to the South.) Nonetheless, in all but one of the four counties, the white population remains the largest single racial or ethnic group there. Even though the white share of the U.S. population is falling, non-Hispanic whites remain the nation’s largest racial or ethnic group, accounting for 63% of all Americans. And whites are at least half of the population in 89% of the nation’s counties with at least 10,000 residents. It is no secret that America’s increasing demographic changes will have far-reaching policy implications at the national and local levels. The States of Change: Demographics and Democracy project — a groundbreaking collaboration between the Center for American Progress (CAP), AEI, and demographer William Frey of the Brookings Institution — is proud to present its first-year results during a public conference led by some of America’s leading political analysts. Project results that will be discussed include a trend analysis of 40 years of national and state-by-state demographic change in the United States —particularly as it has affected the pool of eligible voters — and projections of the racial composition of every state through 2060, both overall and by eligible voters.